While aggressively expanding its market leadership in the critical South region, Honda Motorcycle & Scooter India Pvt. 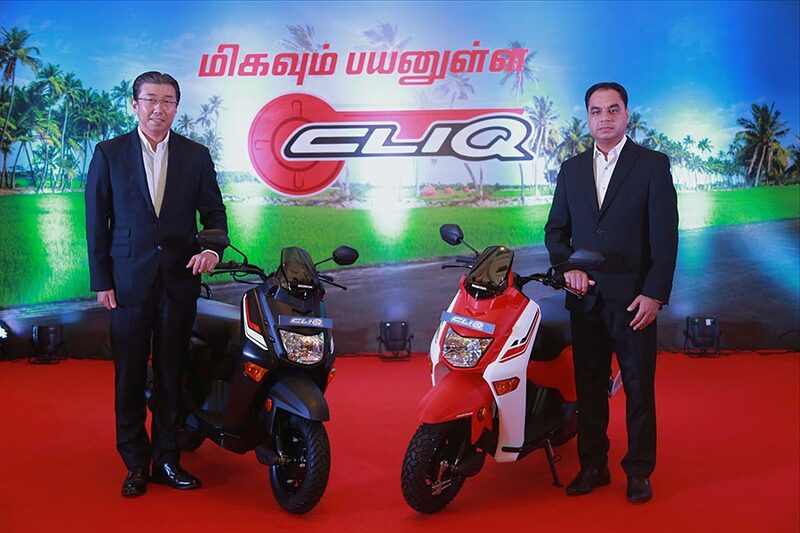 Ltd. today launched its all new 110cc scooter – CLIQ in Tamil Nadu. Developed specially to give maximum utility with an additional value of comfort and convenience, Honda CLIQ is India’s most practical scooter. The new revolutionary CLIQ marks Honda 2Wheelers India’s next big step to further boost scooterization in the upcountry markets. After extending its leadership in southern states of Kerala, Karnataka and Telengana; Honda is the New NO. 1 selling two-wheeler brand of Tamil Nadu as well. Honda 2Wheelers is not only driving Indian industry momentum but also leading Honda’s global two-wheeler business which is conducted in more than 120 countries. Armed with the latest capacity expansion of Narsapura plant, Honda has set its most challenging target of 6 million unit sales in FY’17-18. The 5 southern states alone contribute an overwhelming 28% to all India two-wheeler industry and Honda is a No.1 two-wheeler brand here with 35% market share. Growing almost 6 times that of south 2wheeler Industry at 23% against 4% growth of, Honda continues to expand its leadership here. Within South, Tamil Nadu is the biggest 2wheeler market by volumes. It is also India’s largest scooter market. Giving further boost to scooterization in the state, today we are launching CLIQ – our next revolutionary product in the 100-110cc two-wheeler segment. With better road infrastructure, co-usage in a family and more women entering the work-force, the primary requirement of riders in Tamil Nadu has evolved from the mileage and price conscious 110cc motorcycles to the more convenient and unisex automatic scooters. Now nearly every 2nd customer chooses to ride home on a scooter with mopeds witnessing a sharp decline. CLIQ is developed for the up-country customers with a progressive mindset, and is a true disruptor in the 100-110cc segment. CLIQ challenges the traditional preferences with its perfect blend of Practicality, Versatility and Value for money. An industry first in terms of OEM fitment in the 100-110cc 2wheeler category, CLIQ’s special block pattern tyres with deep grooves provide extra grip and better control over patchy roads under all weather conditions. These rugged tires are also more durable and have a longer life. Wide & spacious foot-board, large under-seat storage space and rear carrier (optional) enhance the comfort and utility of increased load carrying capacity. CLIQ is powered by the trusted 110cc Honda BS-IV HET (Honda Eco Technology) engine, which delivers superb mileage with no compromise in performance. With the engine delivering 5.91 Kw of power and a kerb weight of only 102 kgs, it has one of the best power to weight ratio which makes it extremely exciting to ride. Ahead of its time, CLIQ comes equipped with Combi Brake System (CBS) with Equalizer technology. (As per Government regulations, CBS will be mandatory on all two-wheelers up to 125cc engine capacity from April 1, 2018). The unique Equalizer in Honda’s advanced Combi Brake System (CBS) distributes braking force proportionately between front and rear wheels simultaneously by pressing just the left lever. This results in reduced braking distance & improved balance, leading to more confident riding compared to conventional braking. CLIQ’s unisex design makes it equally comfortable to be ridden by both male and female riders. Far more convenient than using clutch and engaging gears, CLIQ’s automatic transmission ensures low cost of ownership and a smoother ride. With lower seat height, lighter weight, CLIQ is easy to manoeuvre through dense traffic as well as narrow lanes. The Mobile charging socket ensures that you always remain connected while tubeless tyres, maintenance free battery and viscous air filter adds to the convenience of the rider. Customers can choose from a variety of optional parts including Front Screen, Floor Cover, Box Center, Cap Cover and Rear Grip which further enhance the utility and aesthetics of CLIQ. These parts can be selected individually by the customer and are economically priced. Honda’s latest stereotype breaking scooter CLIQ is manufactured at Honda’s second plant in Rajasthan. After its debut in Rajasthan in June and Maharashtra in July, CLIQ is now available for sale across Tamil Nadu. The new CLIQ comes in four attractive colours: Patriotic Red with White, Black, Moroccan Blue with White, and Orcus Grey and is available for sale in Standard & Graphic variants at an attractive price starting Rs. 44,524 (Ex-Showroom, Chennai).